What Athens in Greece, Stays in Greece! After an insanely gorgeous few days in Santorini, we flew back to Athens for 2 days before heading back to the states. In my opinion, Athens is super underrated, because when people go to Greece, they always rush out of Athens to venture out to the Greek Islands, but I highly recommend carving out a couple days to explore this ancient yet modern city. Not only are there a plethora of ruins but the youthful buzz, poppin’ nightlife, delicious eats, and vibrant culture means it really has a ton going for it. Once again, I love that we saved Athens for the end of our trip because it was the perfect way to wind down before heading back to #worklife. We got to Athens via Ryanair, and I’m calling out this airline because we had a horrible experience with them with the whole check-in bag situation. We had been using a carry-on the whole trip with no issues regarding the size of our bag, and for some reason the folks at Ryanair would not let us take our bags on the plane as a carry-on. Most planes will check in your bag for free if there isn’t enough space on the plane for it, but not Ryanair. We had to pay 63 euros each to check-in our small bag (still salty). Our Airbnb in Athens was gorgeous, located in the heart of Athens and near the Acropolis and Plaka District—really recommend staying in the heart because of the vibes and just how close it is to everything. Athens is home to the most breathtaking ruin - The Parthenon. The former temple, which dominates the hilltop Acropolis, is gorgeous. 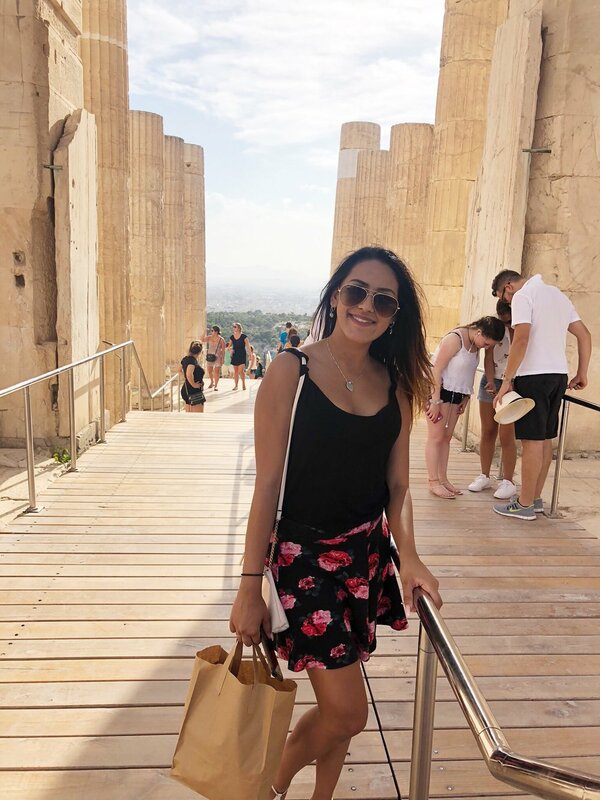 Dedicated to the goddess Athena, you really have to pay a visit to see why it’s considered one of the greatest cultural monuments in the world. While others recommend tours, we purchased a ticket to explore the Acropolis ourselves. We spent hours just wandering around and soaking up the history. Other monuments include the Theatre of Dionysus (located right next door to the Parthenon)—it’s the first stone theater ever built and where the Greek tragedy was first created. I recommend purchasing the multi-site ticket package so you get entry to all the different sites. Before visiting the Acropolis, we checked out the Acropolis museum located 10 minutes walking from the Acropolis. I personally loved the museum because we were able to learn so much about Goddess Athena, the different wars, how the temples and theaters came to be etc. before visiting the Acropolis (this is probably why we didn’t need a tour guide!). 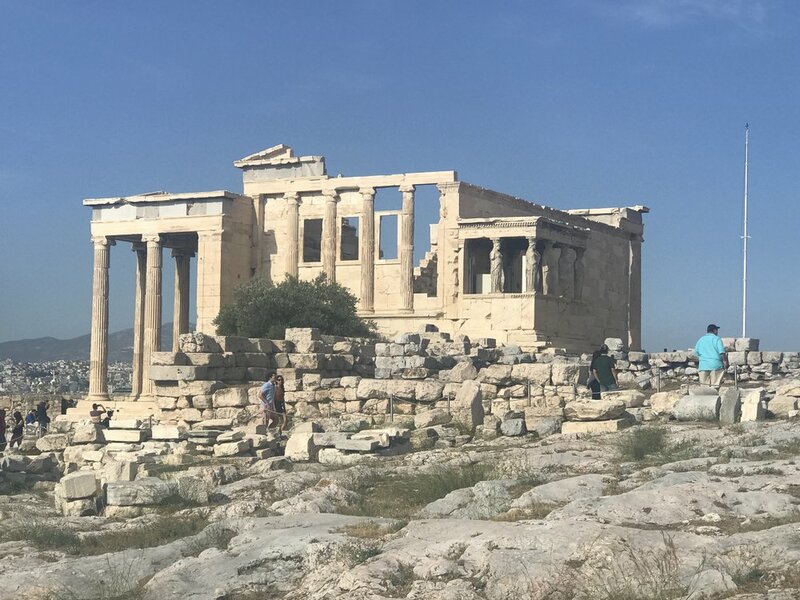 There are a lot of other ruins and temples located around Athens, but we didn’t get a chance to see everything given our jam-packed two days. One of the coolest experiences of my whole entire life. We heard about Dinner in the Sky from a family in Santorini and when we went to go make reservations, they were all sold out. 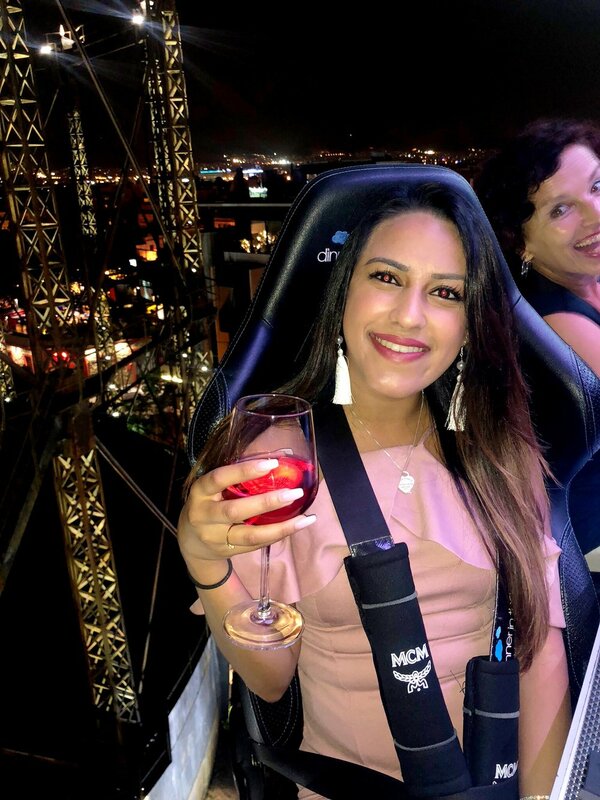 The company told us that a party had booked all the seats, but somehow we got super lucky and last minute two seats opened up for the 10:30 PM City Lights dining experience. When we got to the Technopolis to aboard this experience, we noticed that all the other members of our crew were from one family—the Antetokounmpo family. I literally remember Nisha saying “I think that’s an NBA player” and then our waiter tells us that they're from the Milwaukee Bucks and we should hold off on photos till the end. 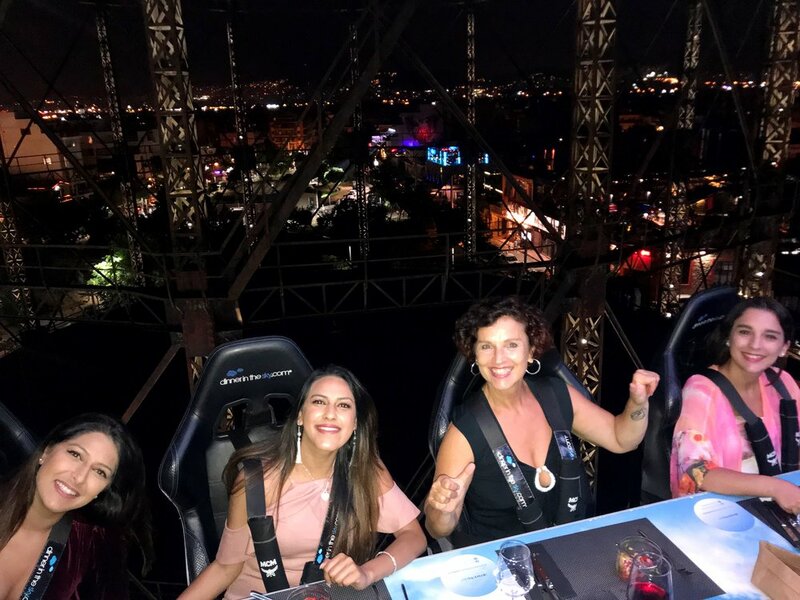 When we got into the sky, the table slowly rotated us so we could see views ranging from the sculpturally lit Acropolis, the surrounding mountains, the sea and the Athenian cityscape. We got to eat a 5 course meal in the sky with unlimited wine with the Antetokounmpo brothers…It doesn’t get cooler than that. 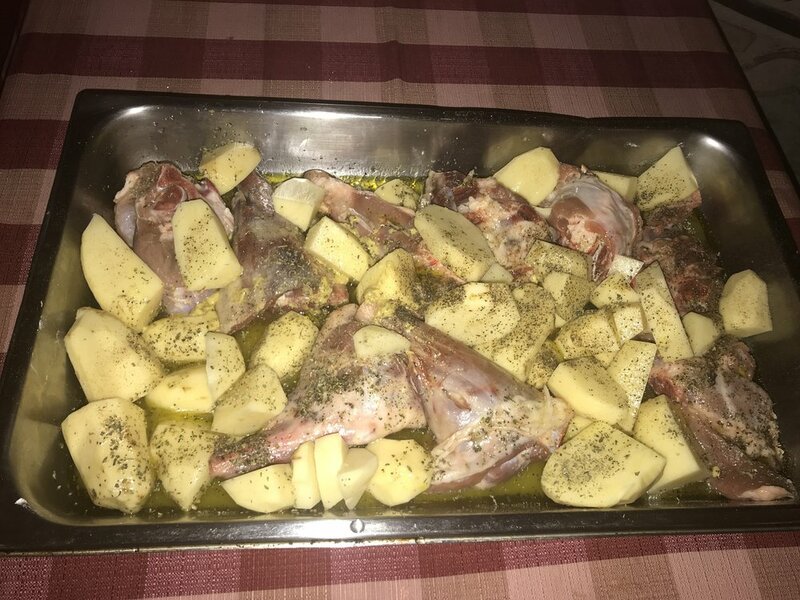 I love Greek food as much as the next person, so I figured, why not learn how to cook it? 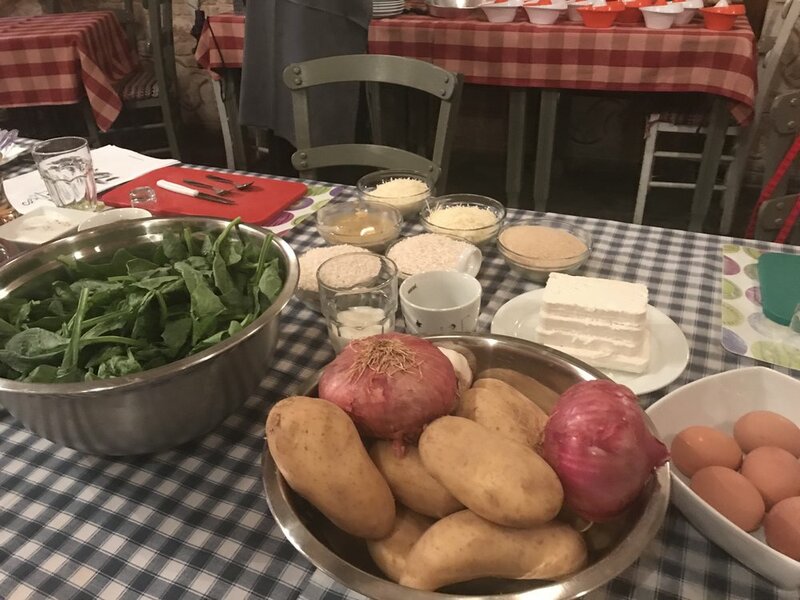 We took the Athens Cooking Lesson via Athens Walking Tour and had an awesome time learning how to cook seven ethnic dishes with recipes to take home. Surprisingly, our whole group was from the U.S., with one family even being from San Francisco—our cooking instructor was so super engaging and informative about the food history throughout the experience. 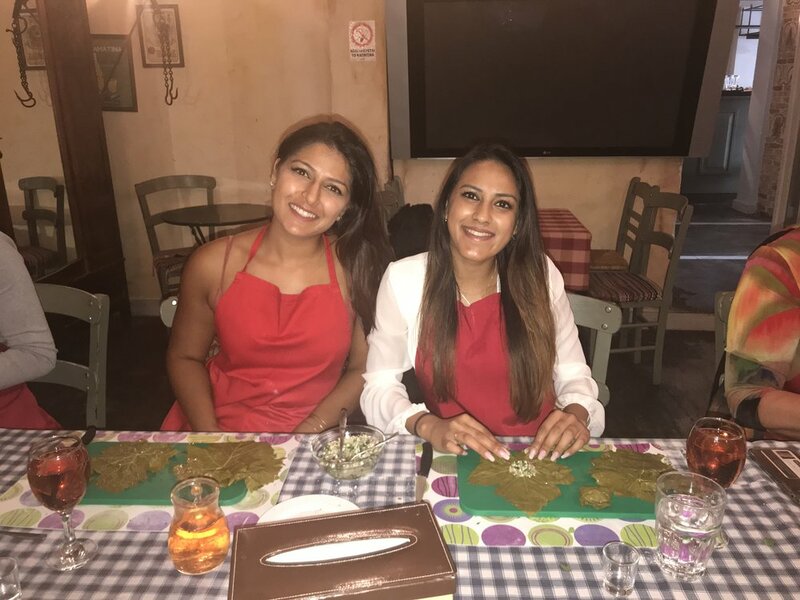 The best part is, at the end of the course, you get to enjoy the dinner you prepared. If anyone is having a dinner party, you best know I’ll be making some bomb tzatziki! 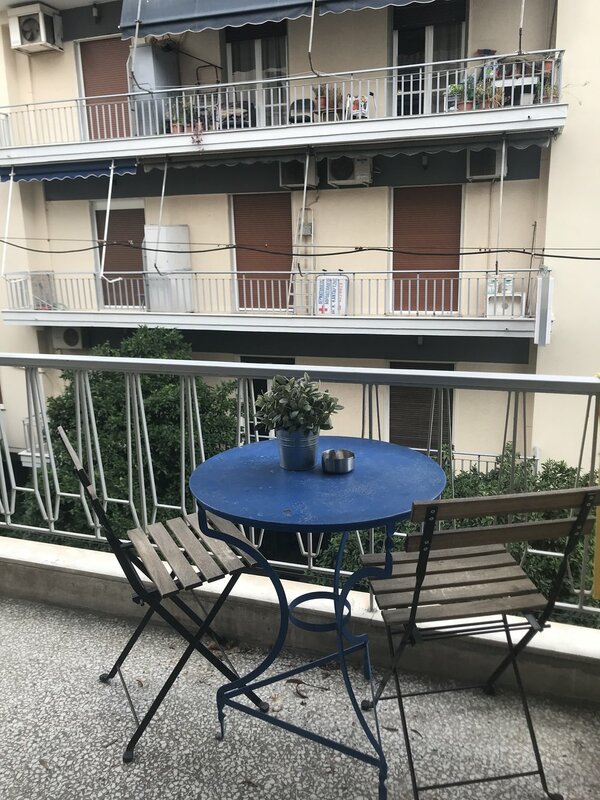 The Plaka District is one of the oldest and most historic neighborhoods in Athens, it’s perfect for if you have some down time and want to walk around and check out the cafes or grab a pastry. We did most of our souvenir shopping here. There's a lot of places here that you can also get massages--we did a 60 minute Thai oil massage which was heavenly. Aside from the Acropolis museum being located here, there’s also a few other museums that you can check out like the Museum of Greek Folk Art. We were craving Indian food by our last day in Athens so we checked out this place called Indian Haveli which was so good—Paneer Tikka Masala over everything. The night life in Athens was lit, we were able to bar hop in the Technopolis area—highly recommend a bar/club called Dirty Blonde. There’s also an amazing rooftop bar located across the street from Dirty Blonde, you can see all the people having Dinner in the Sky and a gorgeous view of the Acropolis. Traveler Tip: Most bars don’t start to get lit till 1 AM, so don’t make the mistake of going early! Overall, I loved Athens, it gave me low key San Francisco vibes and was just the perfect ending to our whole trip. We also did a really good job with balancing our party scene with sightseeing and unique experiences. One thing about Athens that I was super grateful for was that it had UBER, this was the one city we didn’t have transportation issues at. One thing we didn't get to do that I wanted to was visit the Hammam Baths -- it's a spa and wellness center that's famous for it's Turkish massages mixed with different oils. It's on the pricey side but if you're into steam baths and then go for it--just make sure you make rezzies ahead of time. I hope this was helpful to those of you planning a trip to Athens and gave inspiration to those who aren’t. If you haven’t already checked out my Santorini trip, you should! I should have the Mykonos blog up next week (hard piecing together everything for this one….). If you have any questions, shoot me an email or DM on my Instagram account (@nehaltenany). I’ve attached my itinerary below along with prices! Happy Vacay!